Enveloped in a family atmosphere dominated by brotherhood and harmony during this holy month, Dr. Noor Aldeen Atatreh, AFU Chancellor, Prof. Abdelhafid Belarbi, President, Dr. Sameer Barghouthi, Vice President for Academic Affairs, Deans, Heads of Departments, academic and administrative staff gathered at the Rose Rayhaan Hotel in Dubai to exchange greetings on the occasion of the holy month of Ramadan. Dr. Atatreh welcomed everyone and thanked the organizer of the event which also aims to promote harmony, interdependence and to strengthen social relations between employees that will provide a positive working environment. Prof. Belarbi added by speaking about the importance of every employee’s role in the university’s continued success. 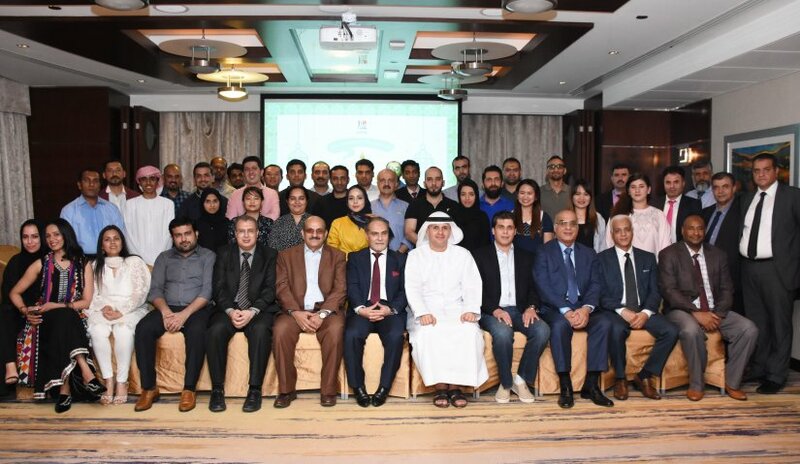 He expressed his support to all academic and administrative staff members through continuous encouragement and renewed commitments for AFU’s development. Towards the end, employees expressed their appreciation to AFU’s Executive Management. Gifts and prizes were distributed to employees who participated during the intellectual and physical strength competitions.